Carolina Pines Regional Medical Center had a special visit recently from the latest K9 they sponsored for the Hartsville Police Department, Duke the explosive detection dog and his handler, Officer Cara Spaziana. 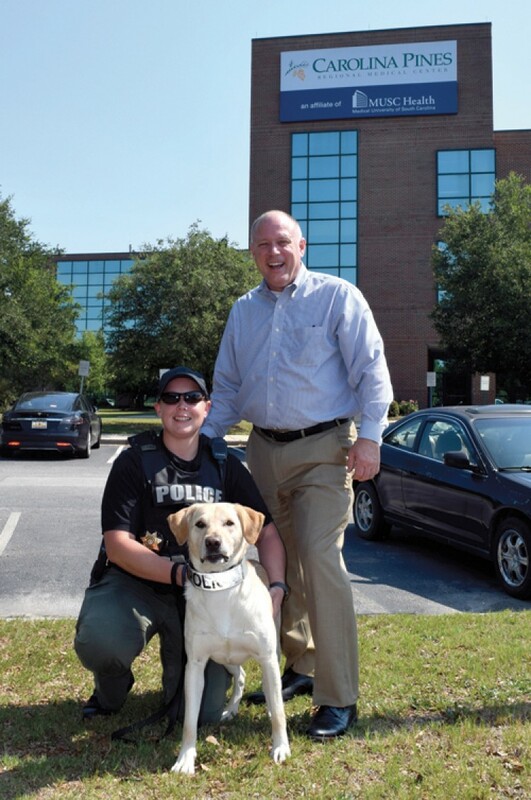 Duke is three years and old and already has made a name for himself in South Carolina, with several real-life callouts assisting other state agencies finding explosives in record time. He has trained in a variety of settings, and can detect the actual ingredients in a bomb – broken down to the exact molecule. Another K9 that Carolina Pines helped to fund is Remy, a narcotics detection dog. Remy is a glossy, pure black lab from the same facility in Ireland, and is an integral part of the drug detection division. Specially bred and trained narcotics dogs typically work for 10 minutes hard and take a break – but Duke worked on his last explosive detection job for 45 minutes straight non-stop. Officer Spaziana had to sit on the floor with him to make him be still. “We have the best bomb dog in the state right here,” she said.